Is this high-school mathematics problem well-posed? A brief discussion of well-posedness, singular problems and invariance, in the context of a high-school mathematics problem. Promoted by my return to NZ for a bit and catching up with family – my Dad is doing a PhD in mathematics education (more on that one day) and asked me to have a go at a problem he is using in a demonstration. I present my first naive solution and subsequent refinement. My Dad and I argue and then possibly agree. I was hospitalized shortly after but our discussion (probably) had nothing to do with this. Version 0.5. Under ‘exam conditions’ – drinking my obligatory daily flat white and having a maths problem suddenly handed to me by my Dad – this was (roughly) my approach. In sketchy, narrative form. 1. Read problem definition. Derivatives. Constraint. 2. Chain rule, implicit differentiation, or something. x’ given. y’ desired. c(x, y)=0 given. All RHS quantities known. Plug in. Assuming no outrageous errors, I think this is what they were after. 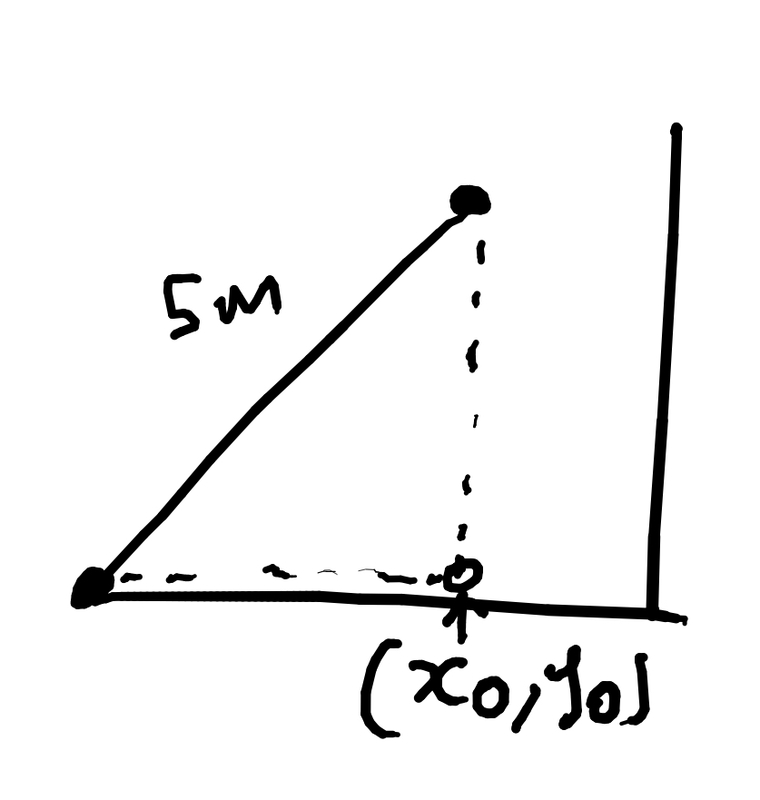 My Dad then asked for the solution for y=0.3m. What he was getting at was this – looking at (3) clearly the problem is ill-defined, or singular, as y approaches zero. This can’t really be saved by any sensible, obvious or consistent dominant balance involving x or x’ going to zero at the same time. This presents a nice toy model for thinking about regularisation (see also here, though the examples there are less directly relevant to the current problem) – I often find it a good principle to think about exactly how singularities arise and think of ways to remove them and hence ‘regularise’ a problem. This often points to a better conceptual understanding of a given problem. As I have said again and again elsewhere on this blog, this sort of process concerns finding, testing and modifying different ‘model closures’. Let’s look at one resolution, that is not in itself incorrect but I don’t find especially illuminating. This was what my Dad pointed me to at some point. We argued a bit about whether this captured the essence of the ‘paradox’ and its resolution. My preferred – but, ultimately complementary – solution is given in the following section. 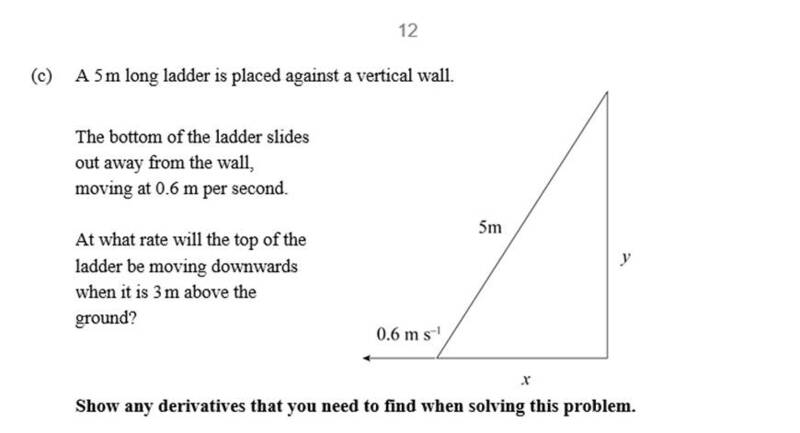 Using results from related rate problems, some calculus books suggest that a ladder leaning against a wall and sliding under the influence of gravity will reach speeds that approach infinity. This Demonstration is built from the actual equations that govern the motion of the ladder as determined by the theory of rigid body mechanics. It shows that a sliding ladder never reaches very high speeds. The motion can be followed in two contrasting situations, with the top of the ladder either free to move away from the wall or constrained to be in contact with the wall. The forces are calculated for the falling ladder just before the top hits the floor. The problem I have with this resolution is that, while likely correct (I haven’t checked all the details), it seems to obscure the key issues. It jumps straight to forces and gravity and Newton. But how exactly does the purely ‘geometric’ problem breakdown? Does it? When do we, if ever, need to move from kinematics to dynamics? What are the key/minimal conservation relations required for a well-posed problem? Note: I don’t think the modification here contradicts the sort of solution proposed in the previous section. It is simply another perspective aimed at conceptual clarification. Again, l’ll adopt a sketchy, narrative description. Singular problems often result from an incorrect reduction of dimension and hence can be regularised by reintroducing additional scales, dimensions, quantities or cutoffs. The ‘physical’ resolution noted that the ladder can detach from the wall. A tension between the wall constraint and the motion constraints appears to produce the singularity. Consider a perfectly horizontal ladder lying on the ground. If it stays attached and the other end continues to move according to the given kinematic condition then the only possibility is that the ladder is being stretched. This violates the (presumably valid) assumption that the ladder is a rigid object (but see later for more on this!). In fact, this shows up in the Wolfram example. The simulation allows you to (requires you to?) solve two different problems – the ladder able to detach and the kinematic constraint (given horizontal rate of motion for the bottom of the ladder) satisfied (I think) OR the ladder not able to detach and the horizontal (kinematic motion) constraint dropped in favour of a rate determined by angular and linear momentum conservation for a rigid rod falling under gravity. Now, for convenience, let’s continue to fix the y coordinate origin at 0, but allow the x coordinate origin to be variable. Call this x0, but note this is not in general constant. Redo the calculations. Keep the same numbering. Differentiate. Note x0 varies in time! Drop constants. This expresses the key problem invariant – the ladder length. As expected, the price of an enlarged, non-singular problem is greater underdetermination. The original problem has x0, x0′ = 0, but if the ladder detaches then these are not true in general. Note y=0 now implies x0 = 0 and/or x0′ = x’. This latter case, with x0 unknown, allows a rigid sliding of the ladder along the ground. In general, we can maintain sensible dominant balances so as to define the behaviour for small y and in the limit as y goes to zero. In general, preservation of the key invariant (ladder length) plus special boundary constraints (touching the wall and/or floor) now allows the solution of particular cases. So we now have two well-posed (or better-posed) problems – touching the wall and touching the floor, respectively – with an underdetermined but non-singular problem in-between. We can’t, for example, say exactly when the ladder might be expected to detach from the wall, on the basis of the given info. The detachment point is unknown. For the sliding problem the initial x0 is also unknown in general. (Relevant exercise for the reader: Google ‘matched asymptotic expansion’). So no, the problem is not fully well-posed, though it is soluble by making special assumptions. It is also (to me) clearer now where the additional information should come from – for example (a bound on) the rotation rate required to keep the bar in contact with the wall, given the kinematic condition (staying as close as possible to the problem as posed). This is of course determined by angular and linear momentum conservation, as in the Wolfram simulation. It also raises other, equally realistic, possibilities though – violation of the rigid body assumption leading to deformation (stretching/strain, where x0=0 say but x’>x0′) or fracture (similar to the detachment case). So, at some point one may need to introduce additional information – eg conservation of linear/angular momentum but also maybe material properties – to solve the expanded problem, but this shouldn’t obscure the key invariants and assumptions used, why they are required and at what point they are introduced. This leads to a more general lesson. The price of removing a singularity by embedding a problem in a higher dimensional problem is typically greater undetermination requiring additional information to solve in full generality. Regardless, it is helpful to view the original problem as a particular limit of an expanded problem. This entry was posted in Uncategorized on November 10, 2015 by omaclaren.